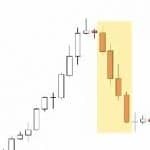 In this article we will be explaining the three most critical stages of price movement. Stage one is the trending stage, followed by the ranging stage and stage three is the transitionary stage. These are the three most important steps of the price. 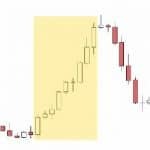 Price moves through these stages over and over and over and thinking about price in these various stages and identifying them will help you understand price action. So let’s look at the stages in a little more detail. First, the trending stage. A trend starts whenever buyers have much more control than sellers or vice versa. 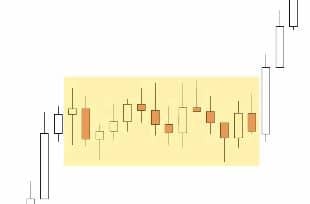 When you look at the candles in a trend, they are mostly large and heading in the same direction, and they have small wicks in the opposite direction. 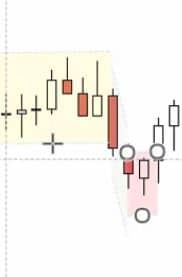 So in a bearish trend, the candles are mainly heading down with small upwards wicks. In a bullish trend, the candles are mostly heading up with small bearish wicks. Trends are pretty easy to identify. What about ranges though? Well, a ranging stage occurs when neither buyers or sellers can break out of a particular area. This is because neither side is strong enough. When buyers go too far up they lose strength and sellers gain control. When sellers go too far down, they lose strength and buyers gain control. Generally speaking, trading in small ranges is quite tough. There’s just not enough movement to either side to be able to enter a profitable trade. Trading in broad ranges though can be pretty profitable. But we’ll look at that later when we look at reversals. 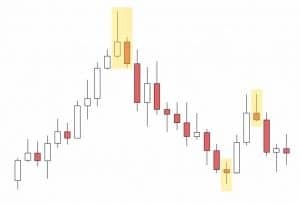 Small ranges are characterised by several small candles, usually a lot of small indecision candles, because that’s what range truly is. A range is indecision. When prices are undecided, it starts to range. 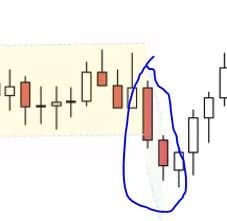 So you do see a lot of indecision candles within ranges but ranges can also be small resting periods of indecision in a trend. 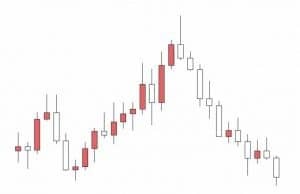 So if buyers have control of price and you see a strong bullish trend that trend may store for two or three candles, this type of range is a resting period. And finally we have a transitionary stage. A transitionary stage is much rarer than trends and ranges and transition occurs at the end of a trend. When a trend dies you get a transition of power. 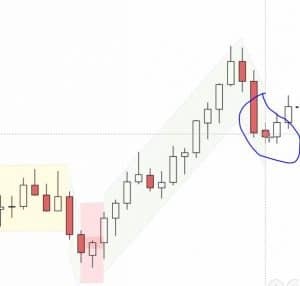 Let’s say you have a bullish trend when the bullish trend runs out of steam, you get a transitionary period before sellers gain control and start the bearish trend. The transition appears in decision candles, usually one or two, sometimes a few more than that. The thing about transitionary period is though, that they can be confused for ranges and vice versa. Before trading transitions, you need criteria in place to differentiate between a transition of power and a ranging stage. We will have more of that later because that’s our speciality. That’s what reversal trading is: you’re looking for those transitionary stages. So we’ll go over that when we look at our strategy in detail. So let’s look at the stages on a real chart where you get a better idea of how they work. We’re going to be marking trends in gray, ranges in yellow and in red we are going to be marking transitionary periods. So let’s get started. First up we have a trend here. A very strong bearish trend quite obvious and quite easy to see. Then what do we have? We have a bit of a range here. It’s a pretty tight range. It would be a very bad range to trade because you’re not getting any decent news. It’s up and down, up and down. It’s just messy moves. So this is a tight range and it’s a range where you can’t take any trades. Then we get a breakout from this range. So, that breakout is kind of a trend. It’s a very short trend, but it is a trend. We have a very short trend here consisting of two candles. Now this candle. What is that? That is an indecision candle and that is what causes the transitionary period. It’s a very brief transitionary period, not a very good one because of the past trend. So the trend that came before the transitionary period is not that great, but it is a trend that came before it. And you’re getting that transition of power. We went from sellers controlling the price to indecision to buyers apparently controlling price. So after that, we got an upward trend. This one was a bullish trend. Bullish and bearish trends of the same colour because it doesn’t matter if it’s a bullish or bearish trend we’re just identifying the stages. So this is another trending stage. After this trending stage, you don’t get an indecision or a transition of power, it just immediately goes into a bearish trend. And if you don’t fully understand that don’t worry about it, we’ll cover this in more detail later. We just want you to get used to seeing trends, ranges and transitions. So now we have another transition here. See, at the bottom of this bearish trend we get this tiny little candle here. That is a transition.